My painting is all about light and how we see it and react to it. It is what drives artists on. It is why most of us paint. Yet light can be as elusive as a wisp of smoke as we try to capture it in all its many moods. My brush is never still. For me, painting is as much a part of the day as eating and sleeping. In fact, it’s more important than that, more like breathing! I could not imagine a single day passing without talking about, reading about, or actually taking part in some kind of activity concerning art. Like a moth is drawn to a flame, a painter is drawn to the light, and although I have tried to express myself with painting in many different forms, mediums and styles over the years, my path has lead me inexorably, like so many others before me, to try and capture that elusive quality of light, that only a shimmering sunset, dawn of a new day, dazzling sparkle of reflection off both sea and river presents to one who is prepared to both look and see. Peter is the former President and a Fellow of the Royal Institute of Oil Painters, a Member of the Royal Society of Marine Artists , the East Anglian Group of Marine Artists and a Fellow of the Royal Society of Arts. He has worked in the field of art and design for over forty years. Peter’s style is bold and vigorous, both in the use of colour and handling of paint, as he explores the effect of light on his subject. 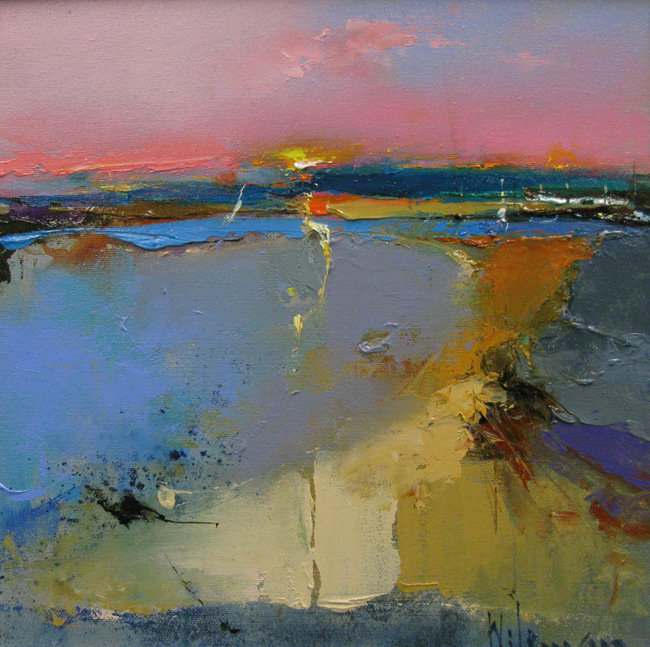 Seeking atmosphere through light and colour, he works in varying degrees of abstraction.